Video Fluoroscopic Swallowing Exam is used to diagnose patients having difficulty swallowing. 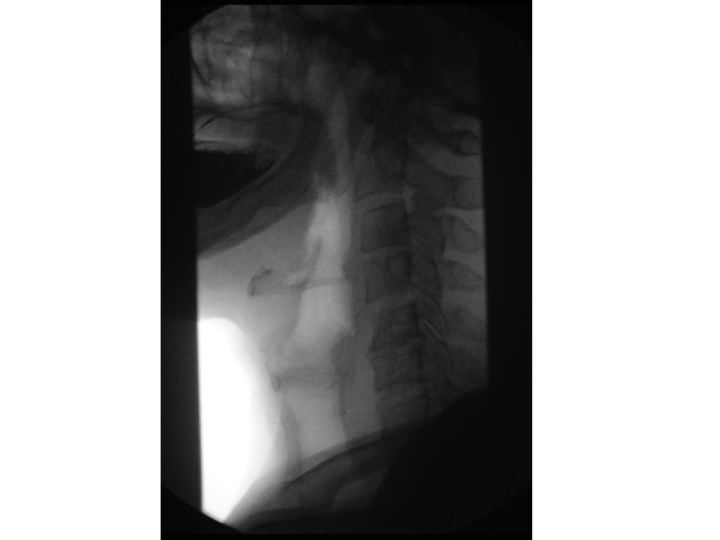 This image shows the start of a Barium swallow study. A Video Fluoroscopic Swallowing Exam involves the throat area. Why is the Video Fluoroscopic Swallowing Exam radiology procedure Performed? A fluoroscope converts the X-rays into video images and provides real-time images, as the exam progresses. There have been no recent advances to replace the VFSE procedure. What is the Cost of performing the Video Fluoroscopic Swallowing Exam radiology procedure? The cost of a Video Fluoroscopic Swallowing Exam procedure depends on a variety of factors, such as the type of your health insurance, annual deductibles, co-pay requirements, out-of-network and in-network of your healthcare providers and healthcare facilities. How does the Video Fluoroscopic Swallowing Exam radiology procedure work? How is the Video Fluoroscopic Swallowing Exam radiology procedure Performed? A Video Fluoroscopic Swallowing Exam is performed as an outpatient procedure at a hospital. A radiologic technologist under the supervision of a radiologist will guide you through the Video Fluoroscopic Swallowing Exam. The actual procedure of the Video Fluoroscopic Swallowing Exam takes about 15 minutes. However, there may be some waiting time or preparation time involved. A physician will request your consent for a Video Fluoroscopic Swallowing Exam procedure using an Informed Consent Form. What are the Limitations of the Video Fluoroscopic Swallowing Exam radiology procedure? A Video Fluoroscopic Swallowing Exam procedure can only evaluate the area from the back of mouth, through the pharynx, to the top of the chest. What is a Video Fluoroscopic Swallowing Exam (VFSE) procedure? What is to be expected during the Video Fluoroscopic Swallowing Exam radiology procedure? No anesthesia is administered during the Video Fluoroscopic Swallowing Exam. There is no blood loss during the Video Fluoroscopic Swallowing Exam. What are the possible Risks and Complications during the Video Fluoroscopic Swallowing Exam radiology procedure? What Post-Operative Care is needed at the Healthcare Facility after the Video Fluoroscopic Swallowing Exam radiology procedure? There is no post-operative care necessary at the healthcare facility, after a Video Fluoroscopic Swallowing Exam procedure. What is to be expected after the Video Fluoroscopic Swallowing Exam radiology procedure? Generally, no complications or side effects are observed after the Video Fluoroscopic Swallowing Exam procedure. If the patient is experiencing an allergic reaction from the barium swallow; then, do contact the physician. What Post-Operative Care is needed at Home after the Video Fluoroscopic Swallowing Exam radiology procedure? There is no post-operative care necessary at home, after the Video Fluoroscopic Swallowing Exam. The Video Fluoroscopic Swallowing Exam requires no recovery time. No tissue sample is taken during a Video Fluoroscopic Swallowing Exam. Who will you receive a Bill from, after the Video Fluoroscopic Swallowing Exam radiology procedure? The patient is advised to inquire and confirm the type of billing, before the Video Fluoroscopic Swallowing Exam (VFSE) procedure is performed.